Apple is hiring engineers and supply chain managers for its operations in Asia as its seeks to expand and quicken the production of new and existing products, reports the Wall Street Journal. These new teams will work out of the company's main Asian campus in Shanghai, China and its office in Taipei, Taiwan. The report states that the company is hiring engineers away from HTC, Inventec and other Taiwanese tech firms to build an engineering team in Taipei. These new hires will quicken the pace of production by working closely with Apple's Asian suppliers on hardware components for the iPhone and iPad. They also will oversee software quality assurance. Apple has added several hundred new engineers and operations staff in China over the past two years, with a blitz of hiring that began in mid-2013, people familiar with the matter said. The total number of engineers and operations staff in China now exceeds 600, they said. 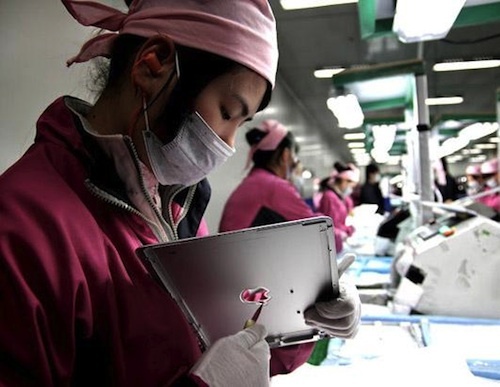 Apple also is adding supply chain managers to its Asian staff in response to ongoing criticism of working conditions in select supplier factories. Apple's new operations in Asia may help combat supply constraints that have plagued recent product launches. The company admitted during its Q1 2013 earnings conference call that production issues limited the supply of the iMac during the holiday shopping season. More recently, Apple warned of low Retina iPad mini inventory prior to the tablet's launch in late 2013. Hey Apple, can you please send some brains to Austin?!? Not requiring a step during production where some human has to sit there with an exact-o-knife carving out the Apple logo from the back of an iPad case. Seriously, Apple, take some of your hundreds of billions in revenue and invest in automation techniques to build your products without the massive human rights violations. Exactly. Doesn't matter if people lose their jobs. Or if it costs more money than is going to be saved. Salaries in all the places working for Apple have gone up a lot in the last years. You know, it's not only salaries that are lower in China. It's the cost of living as well. Overtime has been reduced year over year. However, the first ever report that I can remember about working conditions in Apple-related Chinese factories said that the biggest number of complaints were about overtime. Turned out people didn't complain about having to work overtime. They complained that there wasn't always as much overtime work available as they wanted. Why on Earth would the average minimum-wage earning American decide to work grueling hours on a factory line making $26,000 annually, when the lazy half of our great nation can now make roughly $50,000 sitting at home on their butts doing nothing and collecting welfare? Scary isin't it? Keep voting for those liberals America. Since you brought it up, in all my years working at a behavioral health facility I've never met a person on welfare that made much more than about 10k. And all of them would, and did, get off welfare as soon as they could. You know what would speed up production??? It seems paradoxical if they do this, while sticking with the annual refresh of the iPhone. If you're going to 'quicken' the product introduction cycle, you're going to have to come out with iPhone 6 some time sooner than September. I don't get it - muti billion dollar company still have people with people with simple tools to build products. You would have thought robots would be doing it by now and being a lot quicker than a human could ever be! I read somewhere that more people work directly and indirectly to apple than there are people In Ireland! You would have thought .... but there are a couple problems that come to mind. (1) Incredibly high capital costs simply make it economically infeasible. (2) Automation isn't nearly as flexible as as human input. Which isn't a problem if you are making one and only one product. But if your machines aren't flexible enough to change production processes, then it doesn't make sense to use them. Whether or not there are such constraints I'm not sure. Finally, considering Apple is the most valuable company in the world, and that the number of people in Ireland relative to the world is quite small, that's not terribly surprising. I'm in agreement with the other posters who mentioned the Mac Pro. Apple does have a big supply issue than needs to be sorted out, but it's not in Asia!